Several years ago I occasionally took on design projects that were referred to me by a local poolbuilder. Having always loved the older homes in downtown Fredericksburg, I was particularly excited by this project. The clients were working with an architect to add an addition and garage to a stately brick home. Part of this remodeling work and Fredericksburg landscape design included a new backyard, centered around a swimming pool. The architect and homeowners had already considered and rejected several pool layouts and locations, so when I stepped in I knew where the pool was going and the general shape of the upper patio – and that’s it. As with any project, this Fredericksburg landscape design project began with detailed meetings with the homeowners. What sorts of activities (besides swimming) would they want to accommodate in the backyard? Was privacy an issue? What existing plants could we keep and reuse? There were a lot of factors to consider when putting together the final landscape plan. 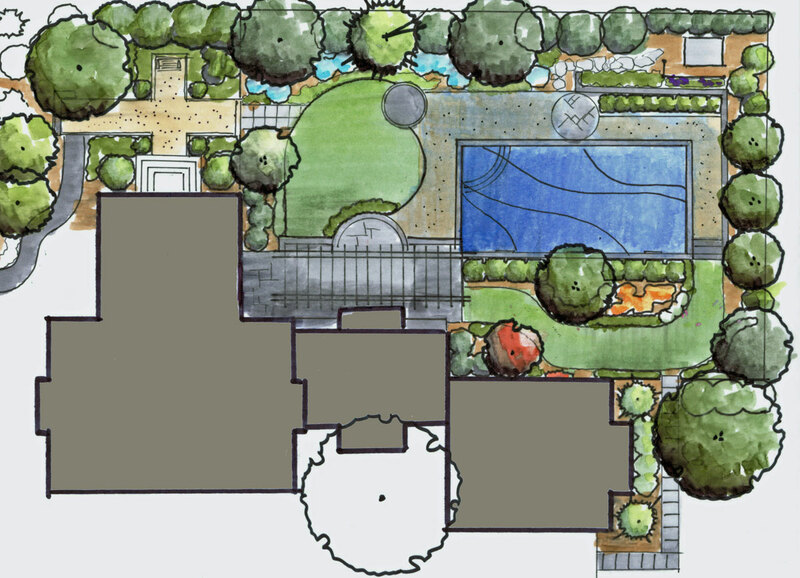 As you can see above, our Fredericksburg landscape design master plan create several distinct spaces in the backyard. 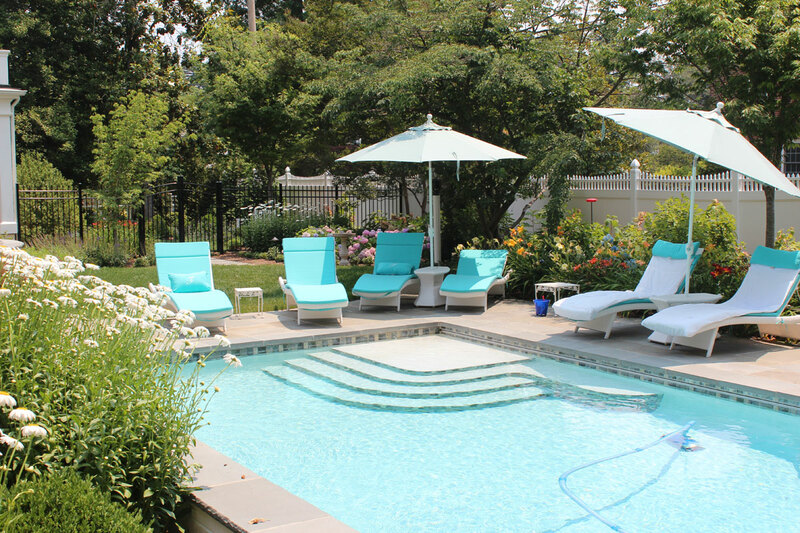 Around the pool is space for loungers and laying in the sun. A circular patch of grass provides a play space for grandkids and overflow for entertaining. The upper patio creates a dining space, and there’s even room for a secret garden. The final result? One of my favorite projects! This is the view when you walk out the rear doors from the kitchen onto the upper patio. We preserved that magnificent Kousa dogwood and the crape myrtle next to it, and added lush layers of hydrangeas along the fence. From down on the lawn you can see into the secret garden. Here in early spring, the purple heads of Allium bulbs draw you towards the gate. We added granite cobblestone borders throughout the yard this winter, look for updated photos! Here’s the view from the far corner of the pool deck looking back at the house. Scroll back up to the before picture, taken in almost the same spot. What a difference! Here you can see everything this Fredericksburg landscape design offers: a generously sized swimming pool, a dining area covered with a pergola, and lush plantings. The homeowners mentioned to me early on that they used to love gardening, but with their busy schedules it became too much. This Fredericksburg landscaping provides loads of entertaining space but also pockets of low maintenance plantings that are easy to care for. You also get a glimpse of the beautiful work by Fredericksburg architect Sabina Weitzman. She was also a joy to work with on this project. This view shows the amount of color this Fredericksburg landscape design provides in season. Leucanthemum, daylilies, and hydrangea all provide dabs of color throughout the backyard. We also provide seasonal color with container plantings. Like what you see? Let’s talk about YOUR yard!